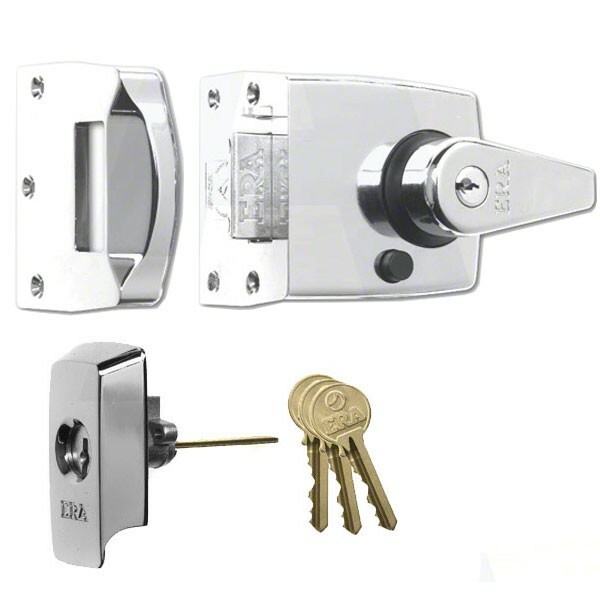 Era 1930 British Standard Nightlatch features an integral cylinder pull which protects the cylinder from being drilled. The cylinder also has well over 30,000 cut key variations. The Nightlatch also comes with a 20mm bolt throw for greater security and strength. This product is ideally suited for glass panelled wooden doors, as it has been designed with an ergonomic internal lockable handle offering added security against forced entry. The main lock bolt "automatically" deadlocks, this makes the use of a credit card to force entry virtually impossible. The bolt can also be held in the withdrawn position (only) with the use of the snib feature. The BS High Security Nightlatch conforms to British Standard 3621:2007 (BS EN 12209), and meets the tough criteria laid down by the insurance companies and the Police.